Comic Books' Secret Identity Revealed In 'Supergods' Bounding tall buildings but grounded in the times, superheroes provide a snapshot of human anxiety and aspiration. 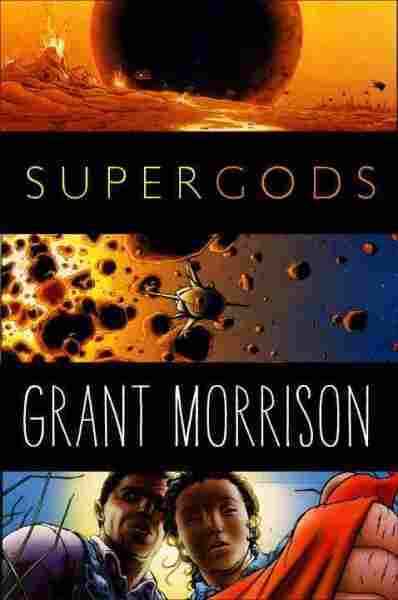 Comic book writer Grant Morrison discusses the human side of the superhuman in his new book, Supergods. 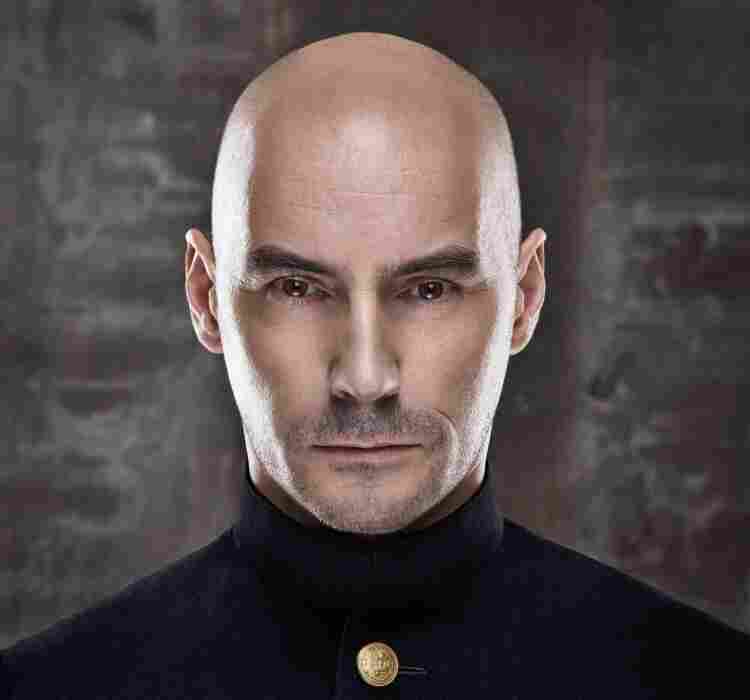 For comic book fans, writer Grant Morrison is something like a god. He's worked for both DC and Marvel comics, writing stories for Superman, Batman and other heroes. In his new book, Supergods, he discusses what comic books can tell us about being human. Growing up in Glasgow, Scotland, Morrison says his love of American comic books was regarded as slightly suspect. "My mother was a big fan of science fiction, and her father had been a fan of science fiction, and that was quite unusual for working-class people in Scotland," Morrison tells NPR's David Greene. "It just wasn't done. It was seen as frivolous, particularly in Scotland, which is very down-to-earth, very grounded. People didn't like the fanciful." As a child in the 60s, Morrison found that comic books provided a welcome relief from the anxieties of the atomic age. "My parents were anti-nuclear activists, so the big fear in my house was The Bomb," Morrison says. "As a kid I was terrified of The Bomb. You know, it was just this thing that would kill us all." And then he discovered Superman. "Superman could take the atom bomb in his face and shake it off and only get a tan," Morrison laughs. "I really attached myself to those guys because they helped me make a lot of sense out of that." Morrison says that Superman's first appearance in Action Comics #1 in 1938 was deliberately ambiguous — and somewhat unsettling for American readers. 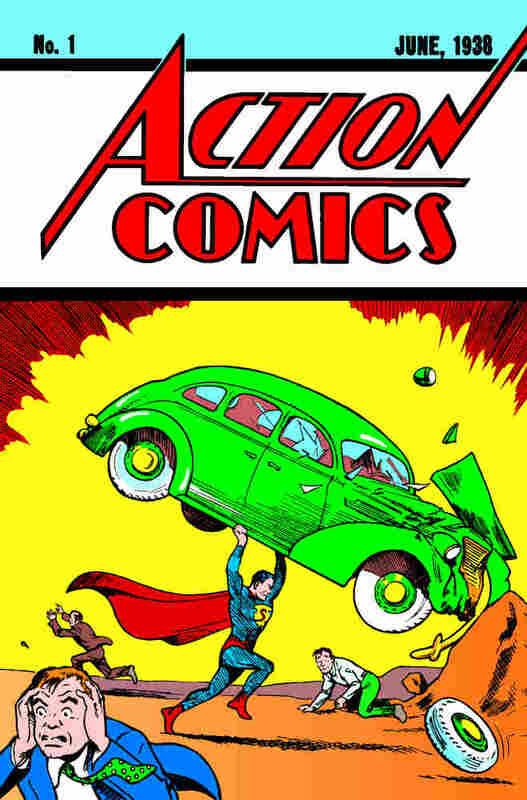 Action Comics #1, published on April 18, 1938, featured the first appearance of Jerry Siegel and Joe Shuster's Superman. "The first image of Superman appears without any copy at all," Morrison says. "No one had ever seen this thing before. And on the front [cover] there's a guy dressed in a cape and tights, smashing a car off a rock while three other men run in every possible direction to get away from him. So that very first appearance of Superman, we have no idea if he's a hero at all." Morrison argues that the destruction of the car — a symbol of American technological superiority — was controversial in itself. "You know, normally we would have seen those cars rolling off the production belts at Ford," Morrison says. "Instead, here was a man actually picking one up and destroying it quite flamboyantly." As Superman captured the popular imagination, many other comic book writers tried to recreate its success. Bob Kane and Bill Finger responded by creating a sort of anti-Superman. Batman debuted in Detective Comics in 1939. "It was very calculated," Morrison says. "Batman is so much an obvious opposite of Superman that it's quite clear that somebody just sat there and broke it all down and put it back together again." Unlike the solar hero Superman, Batman hangs out at night. While Superman works alone, Batman lives more like a rock star. In Supergods, Morrison writes that Batman was like the Rolling Stones to Superman's Beatles. "Batman was cool," Morrison says. "You know, Superman had a boss and worked in a job. And the girl across in the other side of the office didn't like him. Batman has a butler, he sleeps in all day, he's surrounded by all these girls in leather who're constantly chasing him and trying to get off with him and/or kill him." Looking at modern society, Morrison says it makes sense that Batman has been more popular in recent decades. "In our culture, it's much more aspirational to be a billionaire success than it is to be a farmworker or a newspaper reporter," Morrison says. "We've become the sort of people who would rather have Batman or Iron Man." 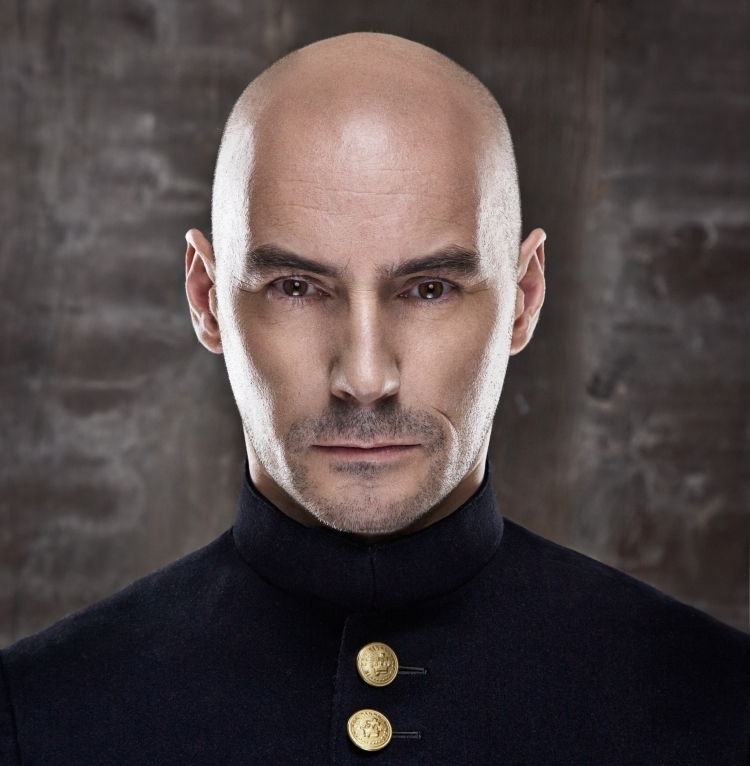 Grant Morrison is an award-winning playwright, screenwriter and comic book writer. His Batman: Arkham Asylum is one of the bestselling graphic novels of all time. Other than smashing cars with rocks, Morrison says Superman's early days were relatively mundane until things took a turn for the strange in the 1950s. "Superman had started out in the Depression. It was very real — real gangsters, real politicians," Morrison says. "But in the 50s it just went insane." Jimmy Olsen, Clark Kent's coworker at the Daily Planet, began cross-dressing — with little explanation from the writers. "So Jimmy would be dressed as a girl, and then he'd be forced to have a date with an ape," Morrison says. "The piling up of madness and surrealism would just get more and more grotesque until somehow Superman would come along at the end and with some very easy explanation [and] it would all go back to normality." Morrison himself decided to cross-dress for a while in his 30s and used the experience to inform his writing. "I'd reached 30, and I'd had a fairly cloistered life," Morrison explains. "I spent most of my teenage years just learning to write and being indoors. You know, a proper kind of geek existence. So I went a bit naughty at 30 and decided to do a lot of the stuff I hadn't ever tried." At the time, Morrison was working on The Invisibles, a comic book featuring a transvestite shaman from Brazil. "So I thought, 'Well, I'm going to learn what it's like to be a transvestite shaman.' I think all writers should do that," Morrison laughs. "I think if Stephen King was to write his next book about a transvestite witch, he really needs to wear a dress." After the release of Action Comics #904 in late August, DC Comics will reboot the 73-year series. 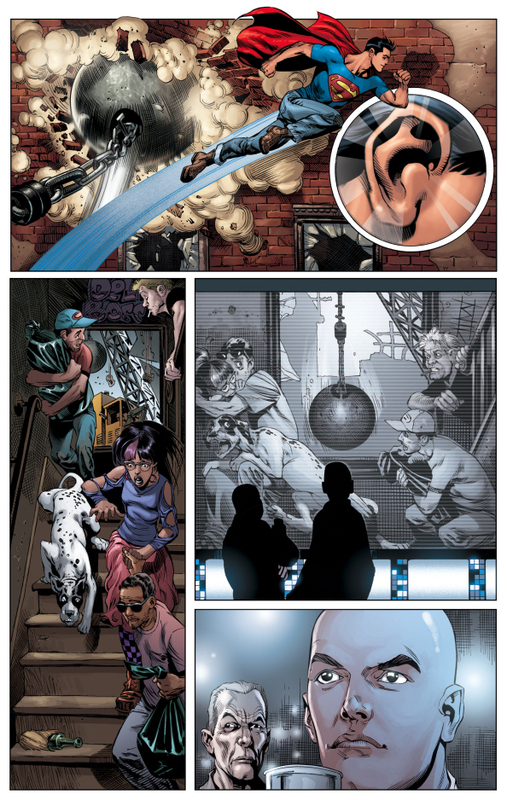 An exclusive image from the upcoming Action Comics #1 — written by Grant Morrison and illustrated by Rags Morales and Rick Bryant — is featured above. So why should non-nerds give comic books a chance? "Well, the easy argument is that they are as good as anything else you might look at," Morrison says. "Good comics are as good as your favorite movie, as good as your favorite record, as good as your favorite TV show and are well worth [entering] the pop culture diet of any smart adult who's living in the 21st century," he says. Morrison argues that, unlike movies and TV shows with slow production schedules, comic books speak to the moment in a more immediate way. "A comic is on the streets within three months of it being created," Morrison says. "There's very little editorial influence, so you see an artist's work directly on the page." And, he says, comic books provide valuable role models for a new generation of superheroes. "When new superheroes appear on the planet — real superheroes — they'll have all this material to study and figure out, 'What are we supposed to be and do?'" He's not entirely joking. Some of those crime-fighters are already here, like the vigilantes from the recent HBO documentary Superheroes. "There's people on the streets waving costumes, fighting crime right now," he says. "They're fighting crime without superpowers. But give those guys bionic legs, give them X-ray eyes and wait to see what happens next."